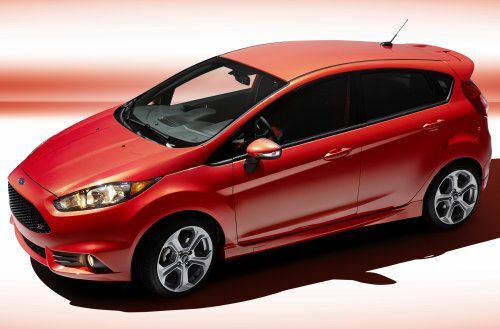 Ford will expand their American high performance lineup later this year with the introduction of the 2014 Fiesta ST and today, FoMoCo announced their own fuel economy measures for the sporty new 5-door hatch with an impressive measure of 35 miles per gallon on the highway. The 2014 Ford Fiesta ST - which is powered by a specially tuned version of the 1.6 liter EcoBoost 4-cylinder engine that produces 197 horsepower and 214lb-ft of torque when running on 93 octane fuel – will offer drivers an impressive fuel economy capability of 35 miles per gallon on the highway. Around town, that same EcoBoost’d Fiesta ST with a 6-speed manual transmission is expected to achieve 26 miles per gallon while the “combined” figure sits at 29 miles per gallon. When you compare that to the Fiat 500 Abarth that serves as the Fiesta ST’s top competition here in the US, the compact Ford 5-door offers a slight advantage on the highway while falling short around town and in the combined column as the Fiat offers 28 city, 34 highway and 31 combined. However, it should be clearly noted that the Fiat 500 Abarth packs “only” 160 horsepower and 170lb-ft of torque and the Fiat is considerably smaller than the Fiesta ST…especially the 5-door models being sold in the US. While European buyers will get to grab up the styling 3-door Fiesta ST hatchback on which the current Ford Global RallyCross cars are based, Americans are currently only slated to see 5-door Fiesta ST hatchbacks here in the USA. Because of the added size of the Fiesta ST 5-door sold here in the US, the 500 Abarth might offer comparable performance even though it packs quite a bit less power than the boosted Ford hatch. Ford expects that the Fiesta ST 5-door with a manual transmission will have a curb weight around 2,720 pounds while the Fiat 500 Abarth tips the scales at just over 2,500 pounds. This means that the Fiesta ST has a power to weight ratio of 13.81 pounds per horsepower while the Abarth rings in at 15.63 pounds per horsepower. Based on those numbers, we would expect that the Fiesta would have a clear advantage in terms of basic acceleration but the diminuitive stance of the Fiat 500 Abarth could give the Italian compact an advantage in handling (and fuel economy). The other side of the coin is that the Fiesta ST 5-door offers real seating for 4 adults and vastly more cargo space under the rear hatch than the boosted Abarth Fiat. We should also point out that these 214 Ford Fiesta ST fuel economy figures are preliminary numbers reached via internal testing performed by Ford Motor Company. These fuel economy figures have been sent to the US EPA for approval and the federal agency can either accept these figures as they are or conduct their own testing to verify the correctness of these figures but when you consider the recent troubles faced by Ford Motor Company over their fuel economy figures of the Fusion and CMax Hybrid models – it would take some mighty large corporate stones to fudge the numbers on a new performance compact. Official EPA ratings (the ones that appear on the window sticker at the dealership) will be announced by the US government when we get closer to the dealership debut of the new high performance compact 5-door Fiesta.